Havana, Cuba- A Strange Introduction | Travel? Yes Please! “I hope we come away from Havana with some good stories,” I eagerly said to Mike as our bus pulled away from the airport. I was excited to be visiting Cuba for the first time, a country I was very curious about. 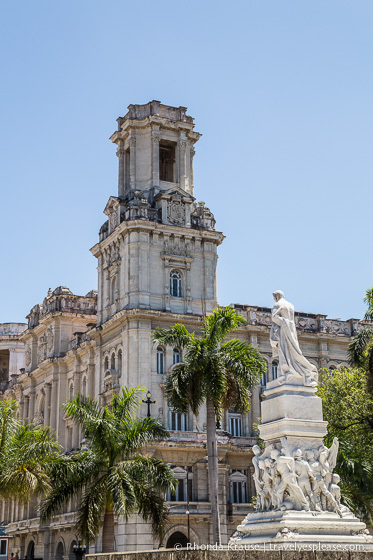 I was especially enthusiastic about spending 3 days in Havana, the lively capital city. I didn’t want to have a superficial experience in Cuba- I wanted to go beyond the beautiful beaches, delve deep and learn about the country and its people. I was hoping to mingle with the locals, since I’d heard they were so friendly, have some chats and return home with a more complete understanding of the country. Less than five minutes after setting foot outside our hotel, my wish came true. It was almost midnight and we had just settled into our hotel. Our room overlooked the Malecón, a seven kilometre long seafront promenade, popular with romantic young couples. We decided to go and take a quick look at the ocean waves crashing up against the wall before we went to bed. There was no one else around on this particular stretch of the Malecón, and it was shrouded in darkness since the street lights were out. Mike and I stood with our backs to the road, looking out into the infinite blackness of the ocean. All of a sudden a man appeared out of nowhere with a basket of flowers, wanting us to buy. We got a little startled because it was so unexpected, but politely declined and the man walked away, no problems. Again, we turned back to the ocean, laughing about how that guy just showed up out of nowhere and gave us a good scare. Thirty seconds later, I hear a car stop and out jump two guys carrying guitars. “Oh great…here we go,” I laughed. “Hola! Where are you from?” one of the men asked. “Ah, Canada. So many Canadians come to Cuba. Why do you all want to come to a Socialist country?” he questioned. “Because it’s beautiful,” Mike answered. “Yes, Cuba is very beautiful, but the government is not,” he asserted. We then continued to have quite the interesting conversation with this man, who spoke near perfect English. He told us he learned English at University, which is provided for free by the government. That statement stuck with us and we saw evidence of this over and over again during our time in Havana. We met many locals, who were University educated but not able to work in their chosen field. Either there were no jobs, or they could make more money from tips, plus get gifts from travellers, by working in the tourism industry. One afternoon we took a ride in a Cocotaxi, a yellow, egg-shaped, three-seat scooter, and our driver turned out to be a power engineer. When we got to talking with him, you could tell he was disappointed that he was driving a cab. He was a very nice man and I could sense that he wanted to do so much more with his life, but circumstances prevented that. Back at the Malecón, our new amigo continued to ask us questions. As we continued to talk, you could tell he was genuinely thankful that we chose to stay in Havana. Cubans have a lot of pride in their culture and are eager to share that with visitors. Considering how little many Cubans have, not only in terms of modern comforts and luxuries, but personal freedoms as well, the fact that they are able to remain proud and spirited about their culture is very admirable. “But don’t worry, Cuba is very safe,” he assured us. This is something that we would hear a lot from the locals during our trip. It really is true though- not once did I feel unsafe in Cuba, even though we landed in some situations that I would usually avoid and advise against. Sometime during this discussion a third man showed up with a set of bongo drums and a fourth guy, who didn’t have any instruments, but oddly hung around the group. Finally the men decided to play us a song. Partway through the first verse of Stand by Me, I hear a screeching sound and see a bright flash of light. I turn in time to see a classic American car skid into a spin, sparks flying off the pavement. The car was sliding towards us when all of a sudden the front wheel fell off and went bouncing across the street! The passengers quickly jumped out and ran over to the Malecón, where they were safe from the passing traffic who would almost hit the broken down car, hidden by the darkness. “Don’t worry, the cops will be here soon. There’s a camera right there, and over there, and over there,” he said as he pointed all around us. I guess that’s why Cuba is safe- there is always someone watching! Sure enough a cop showed up, we think on foot because there were no sirens or flashing lights, and assisted with the situation. I saw someone crawl under the car and try to fix it, which was complete madness! There were no hazard lights or pylons put out, plus the road was in almost complete darkness. Cars were speeding by, swerving at the last minute, making sure to honk as they whizzed past. Mike wanted to get the heck out of there, worried he was going to see someone get ran over. Our new friends didn’t seem too concerned, so I danced along while they played an upbeat Spanish song I recognized. After our private street concert, we decided to get back to the hotel before anything else crazy happened. We gave them a small tip, they welcomed us to Cuba, and we went our separate ways. That night as I lay in bed, I couldn’t wait to see what Havana had in store for us. I was excited to explore this spirited city, meet more of the locals, and continue to learn about life in Cuba. Little did I know, tomorrow we would be hustled and hassled in Havana so much that my enthusiasm for the city would begin to drain right out of me.